The future of a company depends on the future of its people. When new talent enters the workforce they are by definition inexperienced. The few top percent of university students will stand out - the ones who have already started a business, earned a research grant, or completed some other remarkable work - but the majority of university students will not have the track record to determine a hiring decision, and this forces employers to pursue new means to evaluate talent, and invest more time in building relationships with our next generation’s workforce. Let’s look at how companies and students alike are making strides toward satisfying work. First and foremost, accept that influx of young talent to your organization is inevitable to its long-term prosperity, and across our economy it’s happening at about 4 million people per year. So if the companies are ready to recruit millennials, how are the students perceiving the experience of joining the workforce? The experience is facilitated and reflected online. Two trends on the discrepancy of student expectations: (1) the level of online communication and (2) perception of experience. It’s a catch-22. Many companies won’t hire someone without ‘experience,’ and young professionals can’t gain ‘experience’ if no one will hire them. The line between academic work, social media activity and work for an employer is finer than a resume can deliver. Facebook was founded in 2004, when the average age of college freshman was 6. The management of social relationship is at least partially expected to be online. Employers are increasingly building followings on social networks and niche communities into to widen their recruitment marketing funnel. 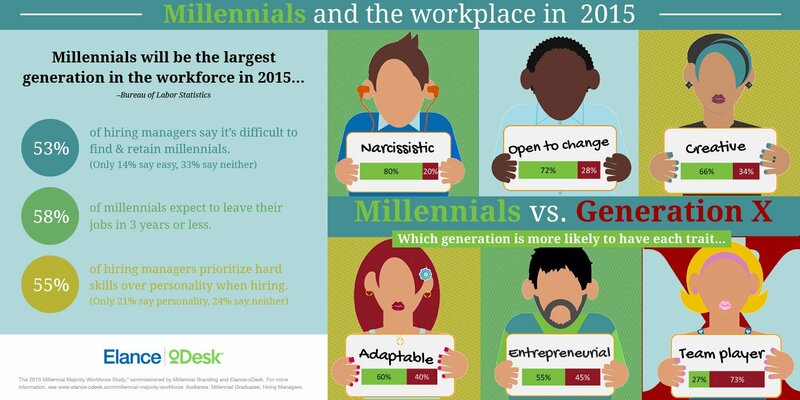 When the present generation hires the future generation, there are workplace expectation barriers. The research above indicates that the average millennial vs. the average generation x person is about 4x as likely to be narcissistic, 3x as likely to be open to change, 2x as likely to be ‘creative,’ and a quarter as likely to be a team player. Ego, adaptability, creativity and teamwork are essential to the performance of your next hire. While in many ways recruiting is still recruiting, as indicated by the top reasons the millennial generation accepts job offers (compensation, development and opportunities), understanding what makes millennials candidates different is what will give recruiters the leg up today. On campus and online, the best companies are ready to engage and nurture millennials on the millennials’ native turf.Rakuna is the campus recruiting solution.